Passed by just before Christmas and it appeared to be shut. Must admit I'd popped in a few times since moving here a couple of years ago and it was pretty grim to be fair. 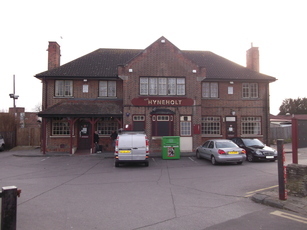 The Alfreds Head is now the Hyneholt (A 13th century spelling of Hainault). I haven't been inside it yet but I attach a picture taken on 6/12/2012. Worst pub in the area. Customers are dregs, matching the beer. I'm delighted to see that this pub has reopened. My name is Chris Greavesand I'm from Leeds but when I was at University in 1972/1973 as part of my course I worked and lived in Hainault and my local pub was the Alfreds Head. This was the best time of my life ---- the people in the pub were great(although some of them were tough !!) --- I met loads of friends and played football with some of them. 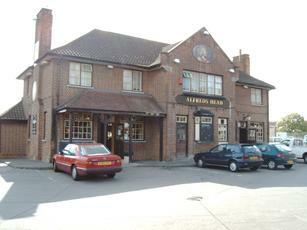 In May and August 2008 i went back to Hainault hoping to see some of the mates I had and was devastated to see it closed . Glad to see it reopened.